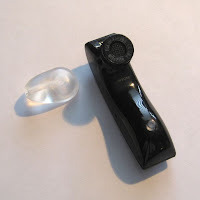 A number of folks have asked about the mechanics of replacing the new Jawbone's earpiece with the Jabra MiniGel, and whether glue was necessary (nope). With no baseball on the tube this evening, I figured I'd snap some quick photos to illustrate the relative ease of attaching the MiniGel. Click on the smaller photos for larger versions. 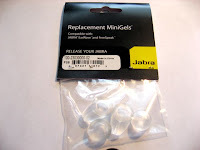 Step 1--source the Jabra MiniGels, from Hello Direct, BestBuy.com, or your favorite aural polymer provider. 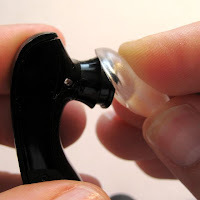 Step 2--remove the existing earpiece from your new Jawbone. I've chosen not to cover that here; if you're reading this, you can likely figure out this part. Prepare your workspace (as if). 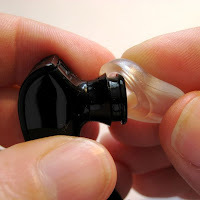 Step 3--observe the recessed area directly behind the earpiece lip. The MiniGel will stretch over the lip, snugly fitting into the recessed area. Step 4--place the MiniGel's opening over the lip of the Jawbone, and pull the gel entirely over the lip. Note from the pressure you can see on my right thumb in the second photo that this does require a smidge of forcefulness. At no time was I worried about the Jawbone's earpiece breaking off. However, from the mandatory disclaimer department, I assume no responsibility if you were unlucky enough to get an earpiece from a defective injection mold. Step 5--rotate the gel to about 7:30 if you're going to use it in your right ear, or 4:30 if you're going to use it in your left ear. One thing that I've found is that the gel's fit on the earpiece is snug--so snug that it's very difficult to rotate the gel on the earpiece. I hadn't realized that this would be the case, as I'd simply transferred my (old grungy) MiniGel from my original Jawbone to my new Jawbone. Over the course of time, the previous gel stretched out quite a bit, as a result of too little care and feeding. The new gel is dramatically tighter, so once you've attached it, I'd be extremely surprised if you felt the need to add glue. Step 6--there is NO step 6. Unless your name is Bruce. First, I think there's gotta be some sort of higher power guiding Josh Hamilton. I mean, what a great way to put forth his message--national TV, crushing the old Home Run Derby record, all the while giving kids a chance to reflect on where he'd been, and where he is now. Second, the double play combo of Whoopi-to-Billy-to-Tino may not be Tinker-to-Evers-to-Chance, but they certainly made their own twin killing memorable--way better than Miksis-to-Smalley-to-Addison Street, the famed double-play combo I grew up hearing about. Third, let's try a short quiz, shall we? A) Saul Hudson, lead guitarist for Guns N' Roses, was better known as? B) Kordell Stewart, late of the Steelers, was better known as? C) In bowling, you record a spare using what symbol? Actually, slash is the symbol. Slash is used in web addresses. Backslash isn't--period. Slash is the hierarchical separator in URLs. Backslash isn't legal. Yet, for some reason, just about every single baseball promo that contains a web address for anything other than the main home page itself (e.g., www.cubs.com, www.sfgiants.com) also seems to contain one of two incorrect statements, both of which are galling to anybody with any type of geek credentials, earned or self-awarded. I hear way too many promos read with the broadcaster saying either "www.cubs.com 'forward-slash' tickets" or "www.sfgiants.com 'backslash' nbc" (as examples). To be clear, I don't think the broadcasters are at fault here--they're reading what they're handed on the promo card. But it's wrong, and it sounds brutal. Garbage in, garbage out...kind of like the Cubs of my youth. Even though he only spent 2 1/2 months in the Friendly Confines in the summer of '74, I'm reminded of Billy Grabarkewitz and others, guys whom the Cubs signed in hopes of them resurrecting their careers with one final fling of day baseball. So, hey, Mr.-I'm-in-the-booth-with-Kruk-and-Kuip, Mr.-I'm-in-the-booth-with-Len-and-Bob, and Mr.-I'm-in-the-booth-with-Ray-and-Glen--how about writing some promos that get it right. Don't burn. The geeks in your audience will applaud. P.S. Len Kasper carries a black MacBook. How freakin' cool is he? New Jawbone + Jabra MiniGel ... Glue? For the commenter who asked about the need to use glue to hold the Jabra MiniGel in place on the new Jawbone...I haven't needed to. On the original Jawbone, the MiniGel didn't stay on all that well, so I know that a number of folks used some type of super glue to provide a better seal. My own reluctance in using glue on the original was a concern that glue build-up (schmutz) on the ring of the Jawbone would make it difficult to reattach the MiniGel when it eventually came off. On the new Jawbone, I haven't even contemplated using glue, for one key reason. 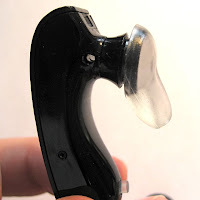 To ensure a suitable fit in the ear, and to ensure that the cheek doohickey thingie (Voice Activity Sensor) is properly pressing against the cheek, I've found that I rotate the MiniGel to about 8 o'clock (viewed when holding the new Jawbone with the VAS facing south) before placing the Jawbone in my ear. I then rotate the Jawbone upwards a smidge (to 7:30 or so) to ensure a good solid fit. Using glue would prevent me from doing so. Thus, no glue. Even so, I don't find the MiniGel jumping off the Jawbone itself. Due to the lack of a suitable carrying case (oh, how I miss the beauty of my Plantronics 640 and 655), I carry my new Jawbone in my pocket. 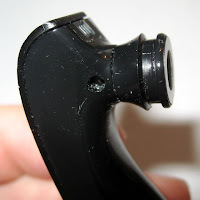 Sure, the MiniGel falls off sometimes, but that's life--reattaching it to the headset takes about 3 seconds. By the way, tomorrow marks the two month anniversary of the new Jawbone's introduction. If you were with us back then, you remember that Aliph somehow managed to not have their Club Jawbone ready to go on launch day. Two months later, they still don't. If you look at my post from the day after the launch, you'll note that the Club Jawbone page basically said, "Go play in traffic. Not only do we not have our stuff together to have our free fan club ready at this time, we're going to be so wildly successful we don't even have the need to capture your e-mail address for further company communications. Don't call us, Child, we'll call you." Well, two months on, and still nothing. I'm intrigued (kind of like when Scooby needed a snack) by the relatively obscure link in the bottom left corner of the lower navigation bar. Either go to the Jawbone website and look for the "CJ" in the diamond shape, or just click on the image here. Two months on, bupkis. Two months worth of potential leads. Two months of potential opt-ins from customers and prospects. Two months of letting the (obviously non-existent) CRM package populate itself. Two months worth of consumer touch, pissed away because somebody can't make a decision on how to put up a simple web form that asks users to enter an e-mail address, with the promise of contact sometime in the future. Aliph management is obviously asleep at the wheel when it comes to inbound marketing. Maybe the plan is to go to CES again next year and give away another couple of barrels full of Jawbones. Sure doesn't do much for cost of sales in my mind. So, David Welden, Roelof Botha, and Gaurav Garg--you're the guys with the investment in Aliph. Maybe you guys can knock some sense into your management team, because Internet Marketing 101 and CRM 201 must've been electives they chose to skip.